This is one of those recipes that seems like it would be extremely fussy and fancy, but the reality is that it’s very simple to make. It’s highbrow enough to serve at a brunch or on a holiday table, but it also just makes a good lunch, light supper, or picnic offering. In a large saucepan, combine the white wine, water, mustard seeds, peppercorns, and 1/2 tsp. of salt. Add the salmon. Remove the salmon from the poaching liquid and discard any skin. Using two forks, gently shred the salmon into small pieces. Allow it to cool completely (I like to poach it the day before I want to use it, and let it chill in the refrigerator before completing the dish). Combine the cooled salmon, yogurt, chives, dill, mustard, black pepper, and remaining 1 1/2 tsp. of salt in a medium bowl. Again using two forks, gently stir and shred until all of the ingredients are well mixed and the salmon is at a fine, spreadable consistency. 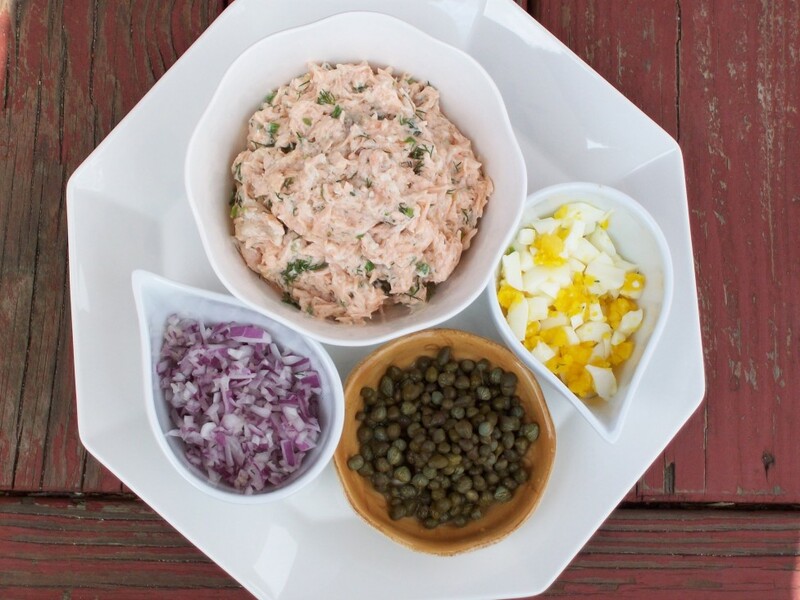 Serve the pate on toasted baguette slices or crackers (or cucumber slices, if you’re gluten-free) with optional toppings: minced red onion, capers, and finely chopped hard boiled egg.